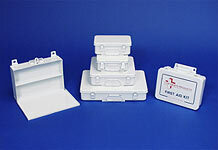 AllThingsFirstAid.com features a complete selection of first aid kit and station boxes for your first aid or special marketing needs in metal or plastic. We have no miminum on our hard boxes, purchase one or buy by the pallet. The kits are blank or we can apply graphics as needed. We thought you might be interested in the time and attention that goes into our empty metal boxes. 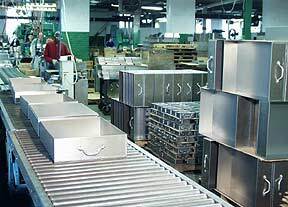 Unlike most suppliers today, our empty metal First Aid Kit boxes and First Aid Station cabinets are again made in the "U S A" in an American owned and operated factory employing US workers. We feel strongly that getting our people back to work in real jobs is the only way we can rebuild our economy. These skilled workers inspect each first aid box and first aid station cabinet as it is made, assembled, welded and painted. For larger quantity orders (pallet size) we can custom paint the boxes and screen print them to your specs. For smaller or standard orders our boxes are painted white. We are happy to apply graphics and/or quality labels to meet your needs. Be sure look for our USA Made products and US Assembled logos and references throughout our site. Great prices for you and good wages for American families. Empty 10-unit Rugged Metal first Aid box which is weather resistant and will resist rust and damage from impacts. Great for marketing kits and special surprises where a "first aid kit idea" is used. This is a great size for small classroom first aid kits, car kits, home first aid and much more. Interior Size is: 7-11/16"W x 2-3/8"D x 4-9/16"H.
Empty 24 Unit metal first aid box waterproof gasketed box used for unitized first aid kit supplies or as the 50 person bulk first aid kit. Made in the USA Dimensions: Interior: 9" x 9" x 2 -1/2" Exterior: 9 -1/2" x 9 -1/2" x 2 -3/4"
We work with American Metal Crafters in the US - one of the last remaining U. S. Manufacturers and their work and pricing is amazing. Why settle for the rest when you can have the best (and support US workers)? Choose from small 10-unit boxes to large 5-shelf cabinets in 1 stop. We offer customization to have your group name or purpose put on the boxes. Any questions as to what size you need? Give us a call - we're happy to advise.